But when Miuccia calls, how could you say no? It’s been little over a year since everyone’s favourite gap-toothed Southern Belle Lindsey Wixson announced her retirement from the runway, but it would seem the model just can’t keep away from fashion – given she just made a surprise appearance at Miu Miu’s Paris show alongside the likes of Kaia Gerber and Adwoa Aboah. Discovered by Steven Meisel when she was just 15, the Kansas-born model has walked for labels including Versace, Dior, Alexander McQueen, and Chanel, but in 2017, she took to Instagram to explain she was bowing out of fashion due to an injury to her foot she had sustained when she was younger. “To all my fashion fans, I am sad to inform you that my injury has put me in a position to retire from this high heel business,” the post read. “Now more than ever I feel it is important to listen to my body and the changing times of this industry and peacefully try to move on.” The model went on to inform her followers that she intended to use her retirement to get stuck into designing interiors, pottery, sculpting, carving, and inventing for the future. 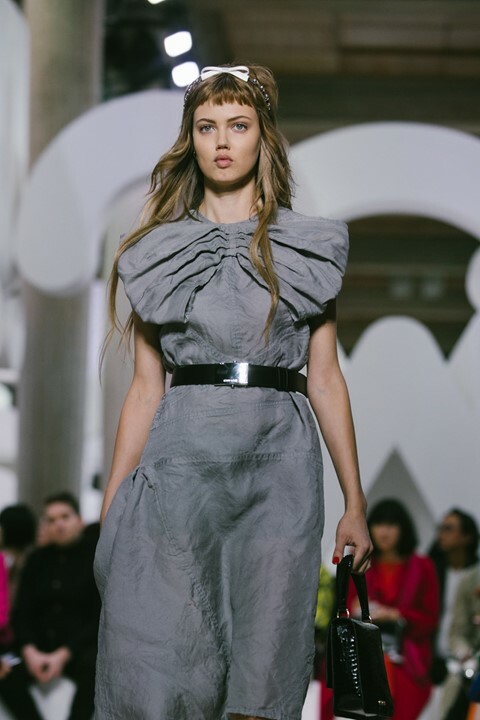 Wearing a mid-length grey dress with a big, ruched bow to the neck, knee-high stockings, and a crystal-encrusted headband, Wixson’s look was finished with a pair of stack-soled, jewelled platforms, proving that when Miuccia picks up the phone and asks you to model for her, it’s nigh on impossible to say no – which doesn’t surprise us in the slightest, tbh. She’s not the only one that’s succumbed to the lure of the catwalk this season, though. A host of iconic faces including Shalom Harlow, Mariacarla Boscono, Kristen McMenamy, Amber Valletta, Gemma Ward, and Stella Tennant all made a return to the runway for SS19, reasserting their status as supermodels and, in the process, showing the next generation exactly how it’s done. Will we be seeing more of them come AW19? Here’s hoping.